This was a day of two parts, and each began with a viewing of the short video made to capture the essence of the first Coalitions for Change event. In the morning, we then moved to thinking about what shared values and principles underpin our efforts to #CoProduceGM. The activity was prompted by two inputs: Beth Perry spoke about the messiness of co-production, the reasons different sectors get involved. Matthew Kidd spoke about his own call to “be a system-changer”, and shared principles from the Lankelly-Chase-funded Elephants project. Everyone was then invited to engage with and compare sets of values and principles, to identify what matters most for those involved with Coalitions for Change. 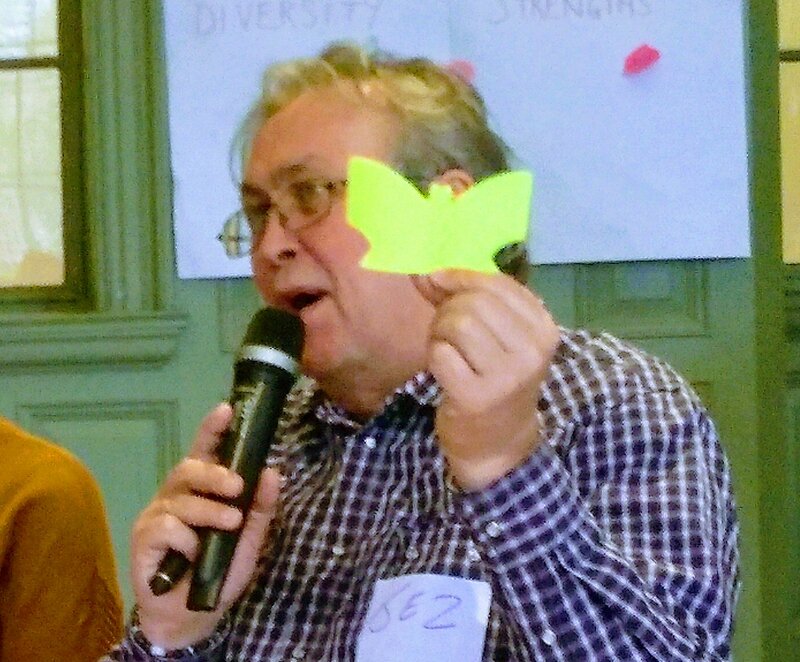 This was an interactive activity, with colourful post-it notes of all shapes and sizes appearing around the room, reflecting responses, comments and thoughts on what’s at the heart of co-production. There were also suggestions for other important, valuable, things to consider when co-producing, e.g. Communications. Some outcomes from this conversation can be viewed below. In the second half of the morning, several participants were invited to ‘Take the Floor’, and talk directly about their particular experiences of co-production. Jez Hall from Shared Future CIC spoke about Participatory Budgeting, illustrating with Scottish and Danish examples. As he put it succinctly, "if it doesn't FEEL like co-production then it probably isn't". He also challenged us to think ambitiously: Paris has 100 000 people voting in participatory budgeting. "Budgets culturally are power", said Jez; but even small scale work pursued over time can lead to good outcomes. 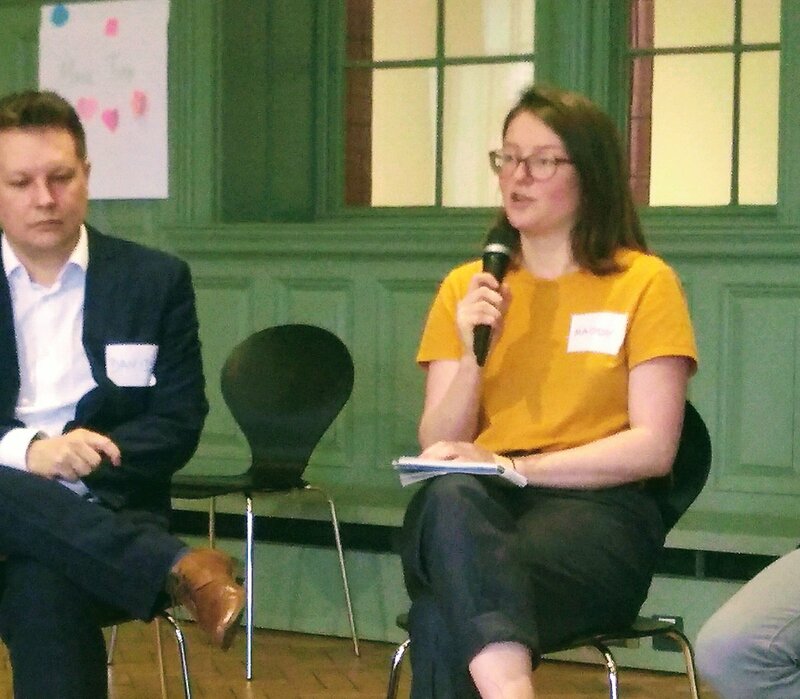 Maddy Hubbard, co-production project manager in the GM Health & Social Care Partnership, spoke about the importance of relationship building -- and how devolution has granted space and permission to give new things a go. For Maddy, co-production brings about a partnership of people where not all the experts are professional. Is the word "co-production" too corporate? Next up was Phil Murphy, an ex-firefighter and current tower block resident. Phil shared his journey from "antagonising people on Twitter" to writing and delivering workshops to help residents and landlords work together on fire safety. Ex-politician Beth Knowles spoke about the sense of working against the grain in her desire to treat everyone sleeping in the district as a resident. For Beth, moving into a university setting has been liberating, giving her space and time to analyse what's happening as well as work on community development. The morning sessions closed with shorter reflections from Matthew Johnson (who started off by acknowledging how even something as simple as holding the microphone quickly puts you in a place of privilege) and Nigel Allmark, who spoke about challenges he has faced while researching co-production. After brief lunchtime disruptions due to an unanticipated fire drill, the afternoon session began with a fresh round of introductions. We were re-introduced to the series of potential goals that had emerged from the first Coalitions event, and worked to prioritise them using the D21 Voting Method. In the process, we also noted how some seemed to be different steps in a common journey. We then moved into temporary 'action learning sets', to explore the principle of this style of peer mentoring and how it might be applied to take forward our common commitment to co-production. One group emerged with some puzzlement: Action Learning Sets focus on a series of problems, each brought and owned by an individual participant. Does this fit with our understanding of co-production? It was an interesting question for some of the Jam & Justice Action Research Collective, who realised they have come to feel comfortable trialling a range of methods to explore the co-productive potential. The overall feedback was very positive, and a proposal to carry forward action learning sets as a component of the Coalitions for Change activity supported by those present. 1) Join an Action Learning Set, meeting monthly from April through to September, to support individual progress aligned with the coalition goals. Read more. Sign up! 2) Co-design the third Coalitions for Change event. 3) Collaborate in the values conversation. Help identify the values that underpin our forthcoming call to action, ahead of Coalitions for Change 3. More information about the next steps. Sign up for an Action Learning Set. Despite cold wet weather, on 29th January 2019 three dozen people made their way to the Anthony Burgess Institute in Central Manchester for the first of Jam and Justice's events to build capacity to #CoproduceGM. Attendees were drawn from within and beyond Jam and Justice's networks, including academics, policy-makers public servants, charity workers, community group leaders and peer researchers. Many of those in the room were people who’d already engaged with some aspect of Jam and Justice’s action research.